Analyze and solve the greatest mysteries of the Victorian era! Ten Sherlock Holmes adventures in which you are the hero! You are a member of the Baker Street Irregulars working to solve mysteries before the Master! You are either investigating the mysteries as an individual, or trying to win against up to 8 other investigators. The curse of the mummy, the murders of the Thames, the mysteries of London, the stolen paintings... strange cases of the most famous detective ever: Sherlock Holmes! Equipped with a copy of the Times, a map of London, a directory and more importantly - your logic, you will roam the streets of London trying to solve the most heinous crimes. Will you visit the crime scene? Meet Inspector Lestrade? The decision is in your hands and each clue that you follow will bring you a step closer to the truth. Unravel the string of intrigue, answer a series of questions and compare your score to that of Sherlock Holmes. Can you beat the Master? Step into the shoes of the famous “Baker Street Boys” as you help out the worlds most famous sleuth. Traipse through London collecting clues as you try to match wits with Sherlock Holmes or against each other! Are you the kind of person who likes to read a mystery novel and try to figure it out before the end? Or are you just a big Sherlock fan? This is your kind of game! Plays great in solitaire, cooperative, and competitive mode. Really feels like you’re solving a mystery. Replay value not so good. Requires expansions to keep fresh. Can get long sometimes depending on how hard mystery is. I’m basing the gameplay on the older edition, because that’s what I have. From what I’ve read, the newest edition is pretty much the same. The goal of the game is not only to solve the mystery, but to beat Sherlock Holmes’ score (solve it faster). The game comes with 10 mysteries or cases and each one is very difficult to get 100% correct and in less clues then Sherlock. You can play by yourself, as a team, or against one another. The game starts with someone reading one of the cases. Then you take turns as a team reading the next clue out of the cluebook for the case or as individuals reading each clue. You must keep track of both the number of clues and which clues you have visited, because that will turn into part of your final score. Each clue is listed in the cluebook as a location on the huge sprawling London map, so the London directory book will be vital for finding coordinates of locations on the map. The cluebook isn’t the only resource for clues. There is the London newspaper at your disposal which contain nuggets of information that may be relevant to your case. You turn to the newspaper anytime and as many times as you want without it costing you anything. Once you are ready to solve the case as a team you will take a quiz then look at the answer to help determine your score. If you’re playing against each other, then players will take turns taking the quiz and determining their score when they’re ready. They can no longer play or give out hints of course until everyone is done. Whoever has the better score wins. This is the only mystery game that I have played that has made me feel like I was really trying to solve a mystery. As you track down clues and interview people across London, you can almost see the old gas lights of London as the fog rolls in over the Thames river in your mind. I like how the game gives you the freedom to pick the order of the clues you think are the best. The mysteries are really worthy of the Holmes lore. The only downside is that once you have solved one of the mysteries, it’s solved and you can’t go back. So after the first 10 are done, it’s over. The only way to keep the game going is through more expansions, and the old edition has quite a few that are hard to find. Let’s hope Ystari reprints them and adds new ones. I will warn players that sometimes it can kind of drag out, because of all the reading. Some players will want to re-read clues (counts towards the total number of clues) or read the newspaper over and over again. When played as a team, I think this game would appeal to social gamers, because of the interaction going on trying to decide which clue to run down and theories explored as to who did it. it’s a fun way to spend the evening. This could also be a good game with older kids that like mysteries. This probably won’t appeal to casual gamers, because these are brain-burner cases. Strategy gamers won’t find an overall long-term “strategy” to the game either, because it’s just pure problem-solving and no formula to the game. I’m not sure how power gamers will feel without the expansions or free form of play. In fact, this is almost a “roleplaying” game in some respects. Overall, this is a fabulous detective game and deserving of it’s “Spiel de Jahres” Award back in the ’80’s. If you love mysteries or you’re a huge Sherlock Holmes fan, you’ve got to pick this game up! Sherlock Holmes was the Spiel Des Jahres award winner in 1985 and unlike many of its compatriots it has aged remarkably well. The game is really quite simple, the rules are well written and easy to comprehend. You are the Baker Street Irregulars and Holmes is giving you the opportunity to best him in the game of deduction. Consulting Detective is generous with its components. You have a daily newspaper, a map of London with references to the locations in an address book and in each case book you have access to all parties involved and some who will have no idea why you showed up at their door step. All you need to do is track down the right person. Then you revisit Holmes and tally up how well you did based on a number of questions he asks you. If you’ve come to the proper conclusion most of the main questions will be easy to answer, but if you’ve come to the wrong conclusion you may begin to get a sinking feeling in your gut, because you’ve just blown the case. This game is an experience every time. There are only 10 cases so don’t rush through. Take your time, embrace the thrill of the chase, and perhaps listen to some violin music as you try your best to outdo Holmes. You won’t outdo him, of course. He’s a master of deduction and you, well… you’re just a Baker Street Irregular. Sherlock Holmes is a co-operative board game for one to eight players. This game was first published in 1983 and has found new life in a recent reprint. It has players taking on the role of the Baker Street Irregulars. Grab one of the ten case files that come with the base game. It’s best to do them in chronological order since the provided documents may reveal a clue from an earlier mystery. The game also comes with a map of London, a location directory of people and places in London, and key editions of The Times newspaper. A list of allies is provided to assist you in your crime fighting. This list consists of the corner, Scotland Yard, informants, and even Sherlock Holmes himself. You will also need paper and a pencil to take notes as though you are an actual detective. Open up the case file and read the introduction text. By getting names from the intro text and by looking though the newspapers you will start to build the evidence trail. Each player takes a turn investigating a clue. You can work as a team or as individuals. The game ends when you think you have enough evidence to solve the crime. There are also a couple of questions that add to your final point total. Sherlock Holmes is really easy to pick up and to start playing since the game basically starts right after you read the introduction to the case. What do we like about this game? We tend to not worry about our final point total – the chase is what makes this game a lot of fun. It does a great job of revealing leads that give the feeling you are getting close to solving the crime. We actually use a large white board where we lay out our suspects so we can discuss the case as a group as we go along. What don’t we like about this game? The text size in the London directory is small, really small. This makes it harder to read for those of us without perfect vision. The font for the leads that you chose is also hard to read – but, this makes sense as it helps obscure other leads that are printed next to the one you are reading. This game was my absolute favourite of last year; I couldn’t get enough of it! Bringing the game to friends’ houses for a cooperative mystery solving session, or having a quiet evening dipping into one by myself. The components are amazing, the art included on the pages and the graphic design is phenomenal and immersive as you’re pouring over the newspapers or looking through the directory. Some of the details and ads in the newspapers are very clever little nuggets of period writing that I appreciate. I find that it’s a great game for a mixed group of gamers and those hesitant to opt into one; with this one, you can say you don’t want to play and then a few minutes later be listening in and have a suggestion to make. In my experience, it pulls everyone around in, and that’s difficult to find in a game, cooperative or not. The only downside? The publishers refuse to confirm an English release on the reprinted expansions. Come on guys, this game needs it and they already exist! If you’re into Sherlock you’ll obviously be drawn to this game. But you don’t play the game as Sherlock, you play the game as Watson and at the end you find out just how much smarter Sherlock is than you. The game is both tense and frustrating because you know with every choice you make your score is just going down because Sherlock figured it out in 10 seconds. This game really inspire me to be more analytic in playing and more carefully when you read some clue to get or connect it with another clue. During a time of play this game, you need more relax to get the clue clear in your strategy for solving each mystery on the card. The clue is on the card, to help you solve the mystery. I have a fun time to solve this game with my colleague, during our trips. I wish this game can have more expansion or series like the novel of Sherlock Holmes itself. 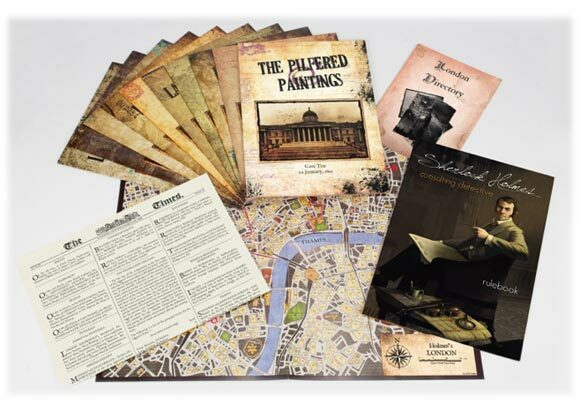 Add a Review for "Sherlock Holmes: Consulting Detective"